Jennifer Fandel’s poetry has recently appeared or is forthcoming in The Baltimore Review, Midwestern Gothic, Little Patuxent Review, Natural Bridge, Calyx, and A Face to Meet the Faces: An Anthology of Contemporary Persona Poetry (University of Akron Press). She is a freelance writer in St. Louis and a contributing editor for River Styx. Lullabies generally attempt to comfort the one being lulled to sleep, but there is no comfort here. It’s easy to imagine each couplet as a separate person or family, tucked in behind their “pinpoint of porch light” hearing the train pass and offering their association with the sound: escape, a howl, death and despair, changed perspective. Slowly those voices accumulate, become a single, collective verdict: “Here, everyone’s waiting.” We’re not told for what, and perhaps that offers a small comfort after all: the strange, stoic solidarity of being lonely together. 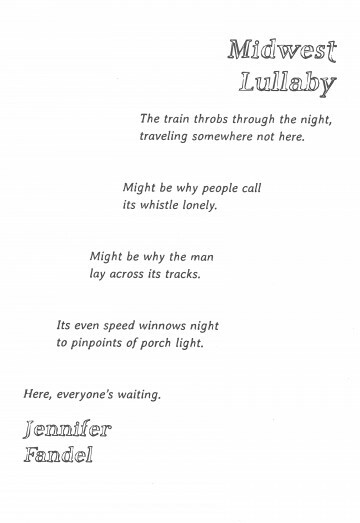 This poem needed to move like a train, and while trains in the United States don’t generally run on steam anymore, it felt appropriate to arrange the poem as if it were a cloud rising back, away from the engine. And since this train isn’t going to stop, the typefaces needed to be there but not there, solid but mostly empty. Both typefaces seem to be evaporating in their own way, Averia in the normal fashion and Phosphorus from the inside out.